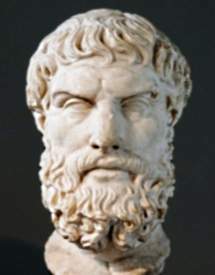 Certain aspects of Epicurus’ philosophy - Epicureanism are still as relevant today as they were when he first taught them in his school in Athens, called "The Garden." The art of living well and dying well are one. Luxurious food and drinks, in no way protect you from harm. Let no one be slow to seek wisdom when he is young nor weary in the search of it when he has grown old. For no age is too early or too late for the health of the soul. Real value is not generated by theaters, and baths, perfumes or ointments, but by philosophy.